The Cincinnati Reds visit Nationals Park on Saturday, June 24, 2017 to play the Washington Nationals. The probable starters are Homer Bailey for the Reds and Joe Ross for the Nationals. The opening line for this matchup has Cincinnati at +152 and Washington at -162. The Reds have a 42-26-3 over/under record and a 38-33-0 run line mark. The Nationals are 36-36-0 against the run line and have a 37-32-3 over/under record. The Reds have a 30-41 overall record this season. Starting pitcher Homer Bailey is expected to make his season debut for Cincinnati. The bullpen has an earned run average of 3.78 and they have given up 238 base hits on the year. Teams are hitting .225 against the bullpen and they've struck out 263 hitters and walked 122 batters. As a team, Cincinnati allows 8.9 hits per nine innings while striking out 7.7 batters per nine innings. They are 29th in the league in team earned run average at 5.08. The Reds pitchers collectively have given up 625 base hits and 357 earned runs. They have allowed 115 home runs this season, ranking them 2nd in the league. Cincinnati as a pitching staff has walked 273 batters and struck out 540. They have walked 3.9 men per 9 innings while striking out 7.7 per 9. They have a team WHIP of 1.42 and their FIP as a unit is 5.26. As a team Cincinnati is hitting .260, good for 11th in the league. The Reds hold a .453 team slugging percentage and an on-base percentage of .327, which is good for 15th in baseball. They rank 10th in MLB with 9.1 hits per game. Adam Duvall is hitting .277 with an on-base percentage of .322. He has 73 hits this season in 264 at bats with 48 runs batted in. He has a slugging percentage of .538 and an OPS+ of 118. Joey Votto is hitting .306 this year and he has an on-base percentage of .419. He has totaled 79 hits and he has driven in 53 men in 258 at bats. His OPS+ is 161 while his slugging percentage is at .601. The Reds have 643 hits, including 125 doubles and 102 home runs. Cincinnati has walked 223 times so far this season and they have struck out 580 times as a unit. They have left 502 men on base and have a team OPS of .780. They score 4.92 runs per contest and have scored a total of 349 runs this year. Washington has a 43-29 overall mark this year. With an earned run average of 5.98, Joe Ross has a 3-3 record and a 1.55 WHIP. He has 47 strikeouts over the 49.2 innings he's pitched. He's also given up 66 hits. He allows 12 hits per nine innings and his FIP stands at 4.85. The bullpen has an earned run average of 5.04 and they have given up 212 base hits on the year. Teams are hitting .269 against the Nationals bullpen. Their relievers have struck out 191 batters and walked 72 opposing hitters. As a team, Washington allows 8.5 hits per nine innings while striking out 9.1 batters per nine innings. They are 11th in the league in team earned run average at 4.13. The Nationals pitchers as a team have surrendered 609 base knocks and 296 earned runs this season. They have given up 93 home runs this year, which ranks 13th in Major League Baseball. Washington as a staff has walked 213 hitters and struck out 652 batters. They give up a walk 3 times per 9 innings while they strike out 9.1 per 9. Their team WHIP is 1.27 while their FIP as a staff is 4.11. As a team, they are batting .274, good for 2nd in the league. The Nationals hold a .472 team slugging percentage and an on-base percentage of .339, which is good for 3rd in baseball. They rank 1st in MLB with 9.7 hits per contest. 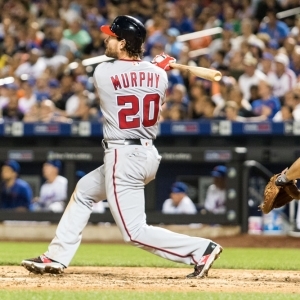 Daniel Murphy comes into this matchup batting .346 with an OBP of .399. He has 92 hits this year along with 49 RBI in 266 AB's. He maintains a slugging percentage of .575 with an OPS+ of 150. Bryce Harper is hitting .310 this season and he has an OBP of .416. He has collected 76 hits in 245 at bats while driving in 55 runs. He has an OPS+ of 159 and a slugging percentage of .596. The Nationals as a unit have 697 base hits, including 144 doubles and 110 homers. Washington has walked 244 times this year and they have struck out on 555 occasions. They have had 503 men left on base and have an OPS of .811. They have scored 5.53 runs per game and totaled 398 runs this season. Who will win tonight's Reds/Nationals MLB game against the spread?